What is he like as a tour guide? Hermann's first published book (1982) was a Leaving Certificate text for Agricultural Science. Prior to the early eighties there was no book available for this minority subject, so he produced his first slim volume during the three months of one summer holiday, drawing entirely on published and often quite out-of-date material. Obviously, a second edition had to follow soon (1986). It was double the volume and based on up-to date source material, much of it then still unpublished. For more than a decade these were the only text books available for the subject until another publisher brought out their own book. A third edition of Hermann's text was published in 2004 and is currently used in more than a hundred schools. In The Shady Roads to Clane (1996) the author takes a light-hearted look at the geological, archaeological, early Christian and medieval origins of the village which Hermann called home for some twenty years, while at the same time providing a worm's-eye view of Irish history and archaeology in general. The book is consummately illustrated with line drawings, both representative and humorous, by Roger Horgan. Fugitive Warfare, 1798 in North Kildare, a collection of more than twenty original essays from fourteen authors, was edited by Seamus Cullen and Hermann Geissel and published in 1998. As the subtitle says, this book is about the rebellion of 1798 in North Kildare, featuring events in Prosperous and Clane and the battle of Ovidstown. It also contains biographical notes on the major players involved on both sides. The book was published by the Lord Edward Fitzgerald 1798 Committee Kilcock–Newtown, in conjunction with CRS Publications. Seamus Cullen, apart from being a major contributor, was the historical editor, while Hermann Geissel took responsibility for the technical aspects of presentation, layout, photography etc. Fugitive Warfare was followed in 1999 by the publication of Oughterany, Journal of the Donadea Local History Group, Volume II, No. 1, edited by Seamus Cullen, Hermann Geissel and Des O'Leary. Previous issues had been produced in 1993 and 1995, edited by the late Noel Reid. Originally the Journal concentrated mainly on the immediate Donadea area, while the latest edition broadened its scope to include the general Donadea – Kilcock – Clane area. This journal has since been discontinued because the editors went their separate ways and followed their own specific interests. A revival seems unlikely at this moment. Read more about this publication here. 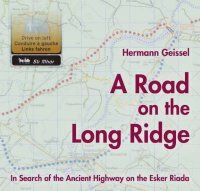 Hermann's interest in road research began with an early awareness of eskers as natural routeways across the wet and often boggy Irish midlands. In The Shady Roads to Clane this interest took a leap forward when during his research Hermann realised that it was possible to predict the existence of a former roadway by looking at the local topography, and that hypotheses thus generated could frequently be tested in the field or by consulting old maps. The next step in road research was the exploration of ‘St Mochua’s Road’ for an article, ‘Via Magna in Ballagh’, published in Oughterany (1999). Investigation of the Slí Mhór or Via Magna on the Esker Riada was an extension of the latter. The findings provided the idea for and the core of the TG4 television documentary, An Slí Mhór, a six-part series broadcast in 2002 and repeated in 2003 and 2006. Over the years that followed the making of the TV series the research was deepened and some of the earlier conclusions had to be revised. The book, A Road on the Long Ridge, was finally published in August 2006. Orders received before 15:00 GMT will be dispatched same-day, where possible.